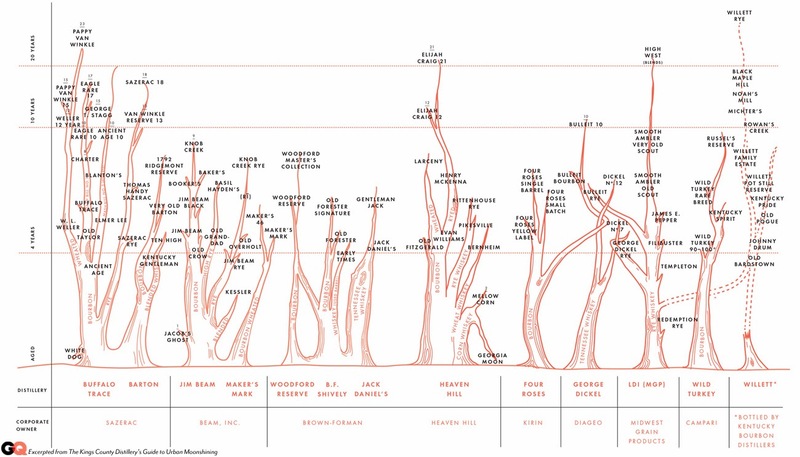 Last week GQ magazine published a Bourbon Family Tree. Showing all of the major distilleries from Kentucky, Tennessee and Indiana the family tree seeks to demystify the huge varieties of bourbons available. Unsurprisingly a few major conglomerates control most the production and sell their whisky under a variety of sub-brands. 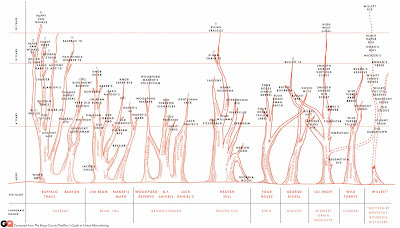 As someone who doesn't know a lot about Bourbon I found the family tree pretty interesting and will use it to help me make whisky choices in the future. If you like a particular bourbon why not try something else from the same part of the tree and see how the taste compares? Alternatively you can use it to find something completely new. One of the articles top tips is to give the W L Weller 12yr old a try. It's the younger brother of the Pappy Van Winkle 15yr old which retails at $700 - $1,000. The W L Weller comes from the same mash mill and barrels but costs just a fraction of the price. Pop over to GQ to read the full article.